When I first went to Bouley, the TriBeCa restaurant headed by David Bouley back in the mid-2000s, I was introduced to what was to me, the strange combination of vanilla, mango and lobster. These days, it is, a pedestrian preparation (for people who eat out regularly). The combination of vanilla and mango served to introduce a floral sweetness that heightened the taste of the lobster, without rendering the lobster sweet itself. In my interpretation of Chef Bouley’s dish, I’ve eliminated the mango element while still retaining the spirit of his creation. 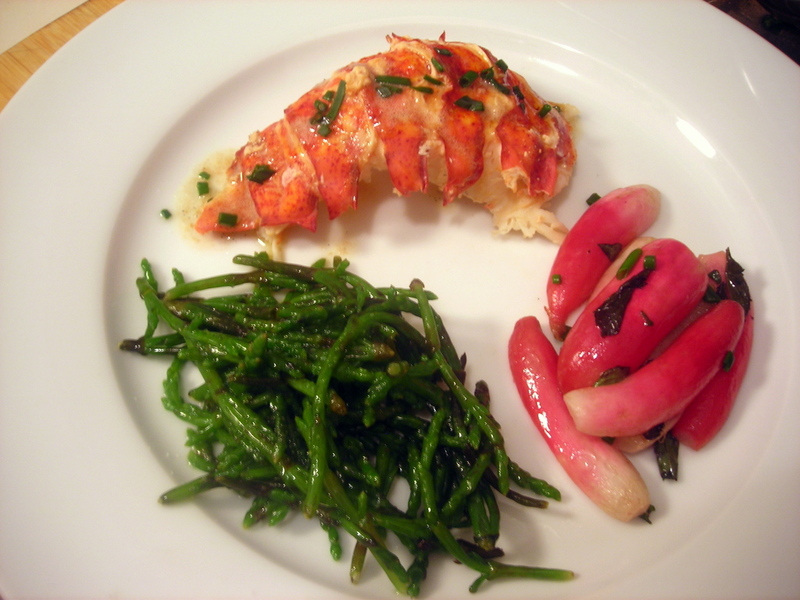 I’ve paired the lobster with French breakfast radishes that were poached in butter and garnished with mint, and samphire, a sea vegetable commonly found growing on or near sandy beaches in various coastal areas around the United States. Although butter appears in two out of three dishes on this plate, as you will see in the recipes below, it’s used more as a flavor enhancer. The net effect won’t be “wall-to-wall butter”, although I leave that for you to judge. Bring a large pot of generously salted water to a boil. Drop in the lobster. Cook for 15 minutes. Plunge lobster into a large bowl of ice water to stop the cooking. Drain after a couple of minutes. Let the lobster rest for about 5 minutes to allow the meat to absorb some of the moisture in the shell. Twist the tail away from the head and twist off the claws. Crack the claws with the blunt back of a heavy knife or a rolling pin. Remove the meat from the claws and set aside in a bowl. With a pair of kitchen shears, make a cut down the soft, translucent shell on the underside of the tail. Grasp both sides of the tail and bend them back, splitting open the shell along the cut. You’ll probably want to use a heavy towel to protect your hands as you perform this step. Pull out the lobster meat and place in the same bowl as the claw meat. You can also cut the tail in two lengthwise to remove the meat. If the lobster has any roe, scoop it out and use to make lobster butter or reserve for another use. Remove the tomalley and reserve it for use with the sauce. This recipe uses only the tail meat; reserve the claw meat and any other scraps for another use, such as the pasta dish in this post. In a small saucepan over low heat, melt the butter. Add the vanilla bean and tomalley, and heat for 1 minute. Taste for salt and pepper. Stir in chives, then remove from heat and set aside. Depending on size, halve or quarter radishes lengthwise. Melt 1 tablespoon butter in a skillet until melted. Toss in the radishes and season with salt and pepper. Sauté over low-medium heat until they become translucent, about 5 minutes. Add the white wine vinegar and cook for 1-2 more minutes or until the radishes turn a vibrant pink. Add the vegetable stock and the remaining tablespoon of butter and cook for another minute to glaze the radishes. Remove from heat and stir in the mint leaves. Taste for salt and pepper once more. Fill a large bowl full of ice water and set aside. Bring one cup of water in a saucepan to a boil. Add the samphire and cook for 2-3 minutes, then remove from heat. Drain and immediately plunge the samphire into the bowl of ice water. Drain. Warm olive oil in a skillet over medium heat. Add samphire and sauté for 2 minutes, or until the samphire turns a brilliant emerald green. Taste one — it should still retain its distinctive crunch while having become tender. Season to taste with black pepper, then remove from heat. You won’t need to add salt because the samphire is slightly salty on its own. Lay the lobster tail on a serving plate. Spoon vanilla-lobster butter atop the lobster tail. Spoon samphire, then radishes onto the plate. Sprinkle chives onto radishes. Serve at once. Time: About 1 hour, including prep. Lobster can be prepped up to a day in advance. 28 Apr	This entry was published on April 28, 2012 at 4:03 pm. It’s filed under cooking, food, food photography, Gluten-Free, spring and tagged David Bouley, dinner, food photography, gluten-free, lobster, radishes, samphire. Bookmark the permalink. Follow any comments here with the RSS feed for this post. Your cooking always amazes me in its simplicity yet exquisite. Every one sounds a 5 star delight. What an inviting plate of food! looks fabulous! any reason for leaving out the mango, or was it just for a different take or to simplify the flavors? I wanted a hint of sweetness, which vanilla provides (via its aroma and flavor) without introducing a sweet ingredient. Also, mango isn’t seasonal since it’s early May here in NYC. I LOVE mango, but yes it has a somewhat overpowering sweetness. I still haven’t gotten used to seasonal cooking (especially since items are generally offered year round here, whether they should be or not, haha), but I really should start paying attention to that. Better quality and flavor, I’m sure!